An Australian property developer has broken with tradition in a revolutionary new apartment building set to become a landmark at Sydney’s Green Square. The innovative design for the $575-million Infinity by Crown Group soon to be built at the Green Square Town Centre was revealed during a star-studded event at Sydney’s Carriageworks early this week. Crown Group Chief Executive Iwan Sunito was joined by City of Sydney Lord Mayor Clover Moore, Former NSW Premier Nick Greiner, model Megan Gale, singer Darren Percival, The Block Judge Darren Palmer, RedBalloon founder Naomi Simpson, star players from the Sydney Kings basketball team, Seven Network’s Kylie Gillies and more than 2000 guests on the evening. 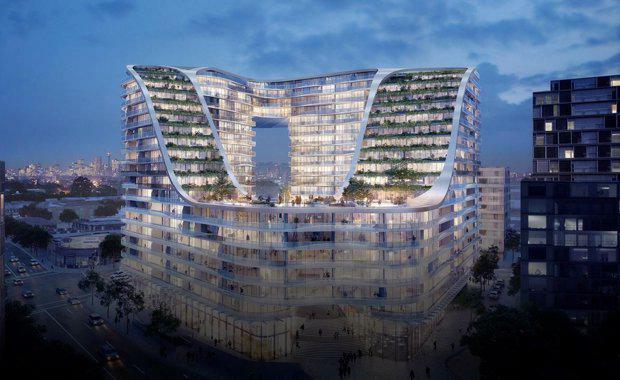 Awarded the 2014 UDIA NSW Concept Design award, the 20-storey, 401-apartment Infinity by Crown Group challenges conventional residential apartment design with a unique looped shape and 1180-sqm open-air garden plaza surrounded by retail outlets, restaurants and cafes. “As a developer I want to be able to create buildings which are beautiful and innovative; buildings which will stand the test of time,” Mr Sunito said. “In selecting the concept for Infinity by Crown Group we looked for a design which would become a key pillar in the new Green Square precinct, work in harmony with the public spaces and most importantly a design which would be modern and beautiful for years to come. “This gateway site in Sydney’s new Green Square precinct demanded something completely new, something which has never been built before."